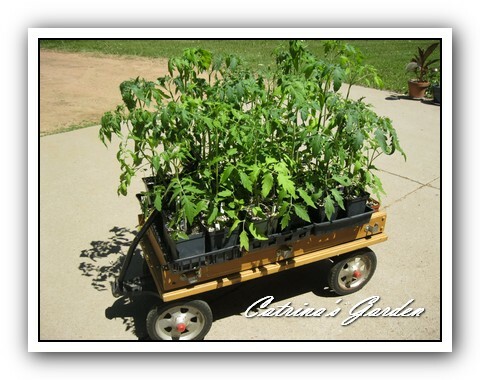 In Salsa Gardening – Before the Thaw we talked about tomato and pepper varieties and getting your seedlings started indoors. In Salsa Gardening – Grow Your Own Fresh Ingredients we talked about other salsa ingredients and how to grow them. Hurray, we’re full into spring and it’s time to plant your salsa garden outside! If you followed this series and started with seedlings indoors…I hope you’ve got a great crop started! If your first attempt at starting indoors was less than successful, that’s okay, stop by your local garden center and embellish your seedlings with purchased starter plants! Then you may have read about “growing your own fresh ingredients” so you can pick up seeds and herbs while you are at the garden center if you have not already grown them. Choose an area with at least 6 hours of full sun and a nearby water source. Loosen your soil and add compost in early spring, working it in, and top dress with compost again after planting. If you want to use fertilizers, it’s best to have your soil tested first to see what it needs. Testing your soil is never a bad idea but you can’t go wrong by adding compost. When planting your tomatoes, plant them deep again like you did when you moved them to the bigger pots, or lay them down in a trench to plant so that only the top sticks up (this illustration is from the University of Arizona Cooperative Extension). Also, tomatoes are subject to disease. To prevent this, choose a different place from where you had them last year. Wait to plant tomatoes out until danger of frost has passed in your area. (This map is from the Wisconsin State Climatology Office) There is lots of advice out there on how to get your plants out sooner and protect them, but really if you just wait a bit, the ones that you planted later will easily catch up to the ones planted earlier. Especially for the peppers and basil; just wait until it is good and warm out. Give your plants space: 3-5 feet between tomatoes and 2 feet between peppers. Use mulch around your plants to ward off weeds and disease by preventing soil from splashing up on the plants. Black plastic will warm the soil, but straw or other organic mulches work well, too and eventually add more organic matter and nutrients to your soil. Provide support. Keeping the plants off the ground also prevents disease and makes them easier to work with while preventing the fruits from laying on the ground and getting bad spots. As they grow pinch off suckers (new branches that grow in between the main stem and the leaves). This illustration is from dummies.com How to Grow Tomatoes. Be ruthless!! Some of the suckers will be small as shown in the first picture and some (especially those growing near the bottom of the plant) will be quite large as shown in the second picture. Preventing all of that green growth will force your plants to produce more fruit. Weed, water and harvest weekly. This task will remind you why you were supposed to start small! Consider using a soaker hose as it conserves water and prevents disease by decreasing the amount of soil that splashes up on the plants. If you use a sprinkler, do it in the morning so plants have a chance to dry before the cool evenings. Consider using a raised bed. This will help the soil warm up faster in spring, prevent the soil from becoming compacted and can be easier to keep weeded.